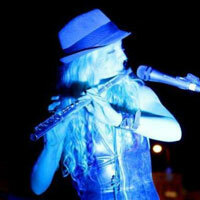 Danielle began playing flute at age nine and was teaching private and group classes by the age of twelve. By the time she was in high school she was playing with professional groups in her hometown of Kokomo, Indiana. Just before beginning her studies at Butler University she decided to take up the bassoon which would soon be followed by oboe, clarinet, and saxophone. She did her graduate work at the University of Michigan studying with the infamous Hugh Cooper. During her time at both Butler and Michigan she also studied dance and musical theatre, and continued performing with professional and civic groups on stage and in the orchestra. She also taught and performed at Brevard Music Center in North Carolina in 1995 and 1996. In January of 1997 Danielle moved to California where she worked behind the scenes and on camera in television, film, radio, stage, and animation. She recorded albums with Elektra Records, performed a summer on The Warp Tour, worked with new composers on film and ballet scores, performed in music videos, played rock and jazz music in all the famous LA clubs, did a variety of musicals singing, dancing and playing multiple instruments and even worked as the assistant to the director on The Simpsons Movie. While in LA Danielle continued her passion for teaching while working with Children's Music Workshop, Key to Joy Music, Youth Orchestra of Los Angeles, Harmony Project and many others. Her collection has grown to more than fifty instruments in her home. She teaches everything from beginning strings and brass, all levels of woodwinds, band, choir, orchestra, music theory, orchestration, etc. She moved back to the Midwest in January of 2017 to help start a new program with Harmony Project KC. She quickly found the Civic Orchestra as well as a few other groups to perform with, as well as becoming a teaching artist on the roster of Kansas City Young Audiences.